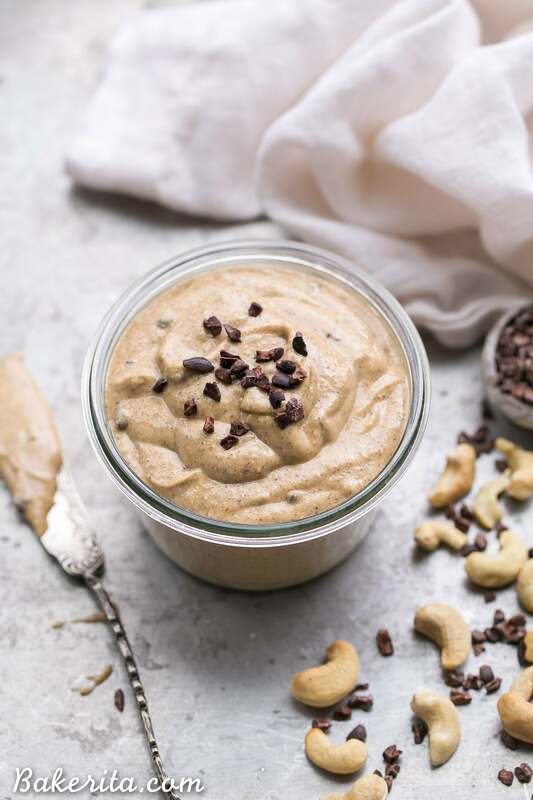 This Chocolate Chip Cookie Dough Nut Butter is made from Paleo and vegan-friendly ingredients, but manages to taste like chocolate chip cookie dough in spreadable, nut butter form. You won’t be able to stop eating it by the spoonful! Coming at you with another nut butter today! And this is a GOOD one, you guys. Like seriously, seriously, sooooo good.Let’s be honest: how can anything with chocolate chip cookie dough as part of the title end up being anything but delicious, right?! 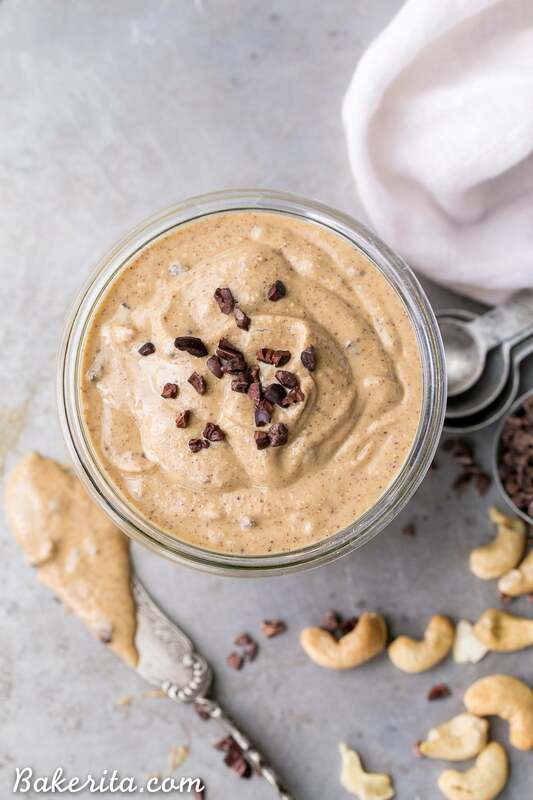 When I started posting all these nut butter recipes, I didn’t know if you guys would be down with them. It’s one of those things most people just buy, right?! But I’ve been super surprised by the number of you sending me snaps and messages with your tales of homemade nut butter making! 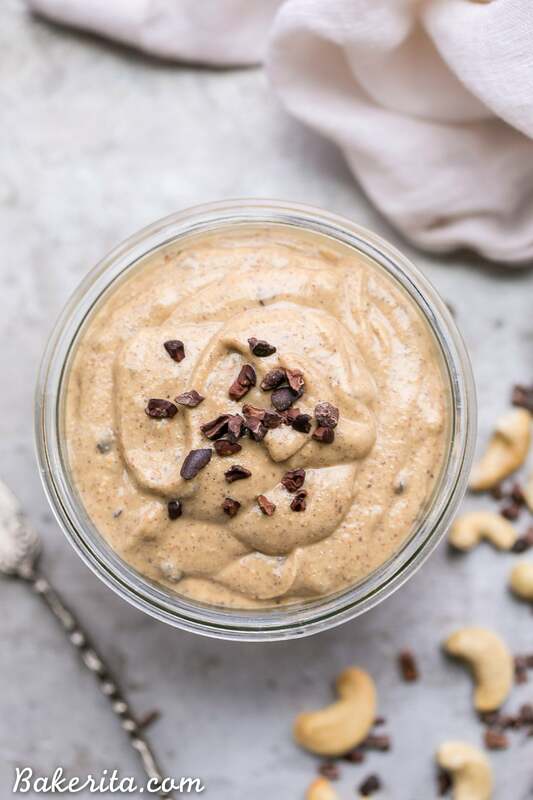 Probably because you can’t get such delicious flavors like Banana Bread Pecan Almond Butter at the store :) now that I’ve boarded the homemade nut butter bandwagon, I’m ALLL about it. Since it looks like bunches of you have jumped aboard with me, I’ll keep the delicious, drippy, nut butter goodness coming your way. My cabinet is currently stocked with a number of delicious flavors, so there’s a lot more where this came from. But today, we’re talking about one of my current favorites: “Chocolate Chip Cookie Dough” Nut Butter. I put the “Chocolate Chip Cookie Dough” in quotes because obviously, this isn’t exactly cookie dough, but it’s certainly inspired by it, and tastes pretty darn similar if I do say so myself. 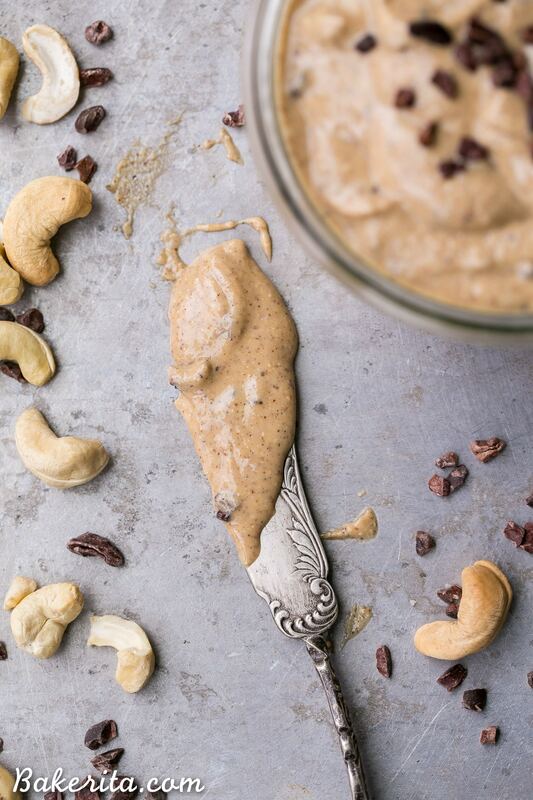 This cookie dough nut butter starts off with cashews and almonds making up the base. I find the flavors of these two nuts make the most “cookie dough”-like taste and texture. I think next time I make it I’ll add some pecans too…their slight sweetness and butteriness might make it even more delicious, so feel free to try that out if you’re a pecan lover like me. 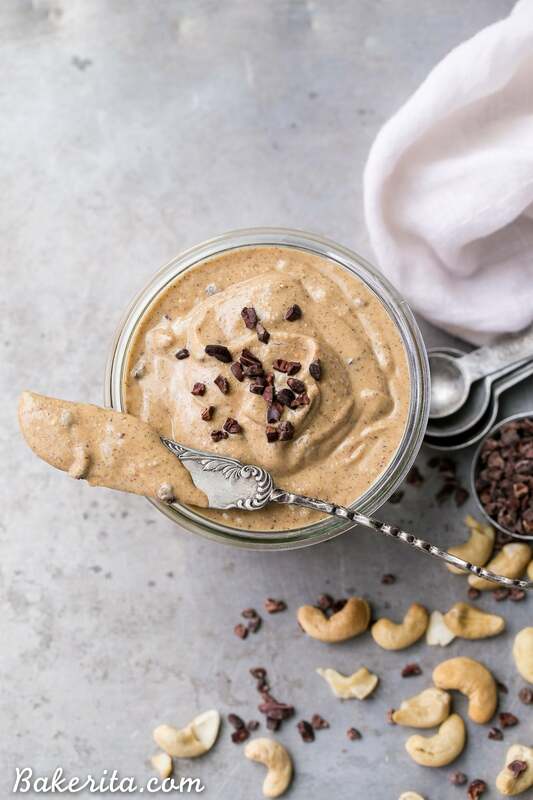 Once the nuts are whizzed together into a smooth, drippy butter in your food processor or high-powered blender, the add-ins are blended in to bring out that delicious cookie dough taste. Vanilla is a must, to help bring out the warm sweetness. Along with the vanilla is a sprinkle of salt, and a bit of coconut sugar. The coconut sugar adds a little bit of sweetness, and adds a little bit of that gritty, raw sugar texture to help replicate the cookie dough texture. The sugar isn’t necessary though – you can definitely leave it out if you don’t have a huge sweet tooth. The nuts add sweetness on their own! Ghee adds that buttery flavor that cookie dough has gotta have. To keep it vegan though, you can substitute coconut oil or even better, buttery coconut oil. Of course, it’s not chocolate chip cookie dough without some chocolate chips. You can keep it classic with mini chocolate chips, or keep it a little healthier by using cacao nibs. I opted for the latter and loved the bit of chocolatey crunch – they replicate chocolate chips super well here. 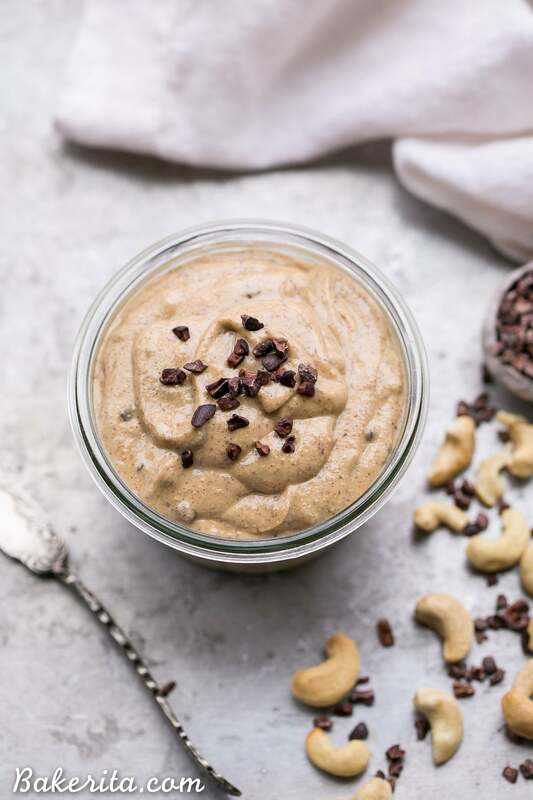 This super creamy and flavorful Chocolate Chip Cookie Dough Nut Butter is pretty irresistible by the spoonful – it’s also scrumptious slathered on a banana or swirled into warm oatmeal. The smooth, sweet flavor of the cashews and almonds is transformed by the vanilla, ghee, salt, and coconut sugar. Preheat the oven to 350°F. Spread the cashews and almonds on a lined baking sheet and bake in the heated for about 8 minutes, or until fragrant and lightly toasted. Let cool for a few minutes on the counter top. You can also leave the nuts raw, if you want. When the nuts are cool, add them to your food processor or high-powered blender (I used my Vitamix). Process for about 3-6 minutes, scraping down as necessary. Your time might be shorter if you’re using a high-powered blender - it will take a little bit longer in the food processor and require more scraping down. When the cashews and almonds have broken down into a smooth, creamy butter, add the vanilla bean powder, salt, coconut sugar, and ghee. Process to incorporate, and taste. Adjust add-ins as desired. Finally, add the cacao nibs or mini chocolate chips and pulse to mix them in. Transfer to a glass jar or two (like a mason or Weck jar) and store sealed for at room temperature for 1 month, or in the refrigerator for 2-3 months. You are the queen of nut butters! I didn’t even know a chocolate chip cookie dough one existed, so now I need to try this. I think I would spread this deliciousness on just about EVERYTHING! Absolutely love the sound of this! Gorgeous. I would find it impossible to not eat the whole batch! It is pretty irresistible!! Thank you! Thanks so much Beth!! It’s pretty irresistible. Wait, what!? I am head over heels for this cookie dough nut butter love child right now. Putting this on everythingggg! Anything that taste like chocolate chip cookie dough that I can eat for breakfast sounds just perfect to me :). This looks absolutely dreamy! Hi Heather! I roasted them with the almonds, but you can use raw nuts if you choose. Hope you love the nut butter!